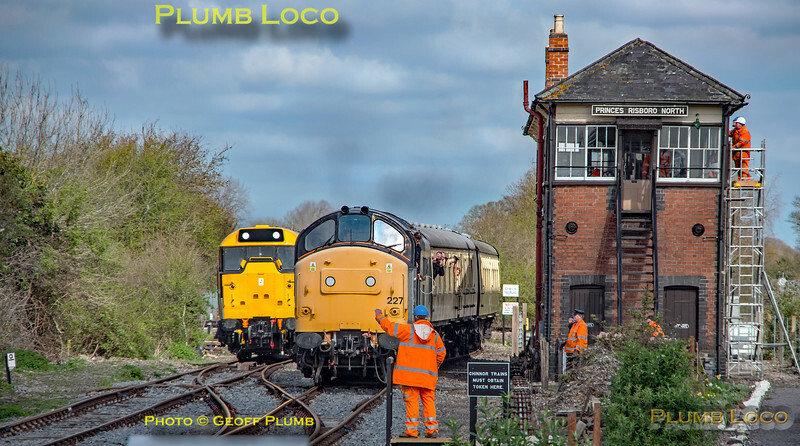 During the Chinnor & Princes Risborough Railway's Vintage Diesel Gala, 37227 arrives into Princes Risborough and is about to give up the single line token as it passes the North Signal Box, where restoration work still continues. 97205 (D5581/31163) waits alongside in the shunt neck to reverse onto the train to take it back to Chinnor. 11:52¾, Saturday 6th April 2019. Digital Image No. IGMP46876.